Australia has external states that are not a part of the states and territories on the Australian continent. 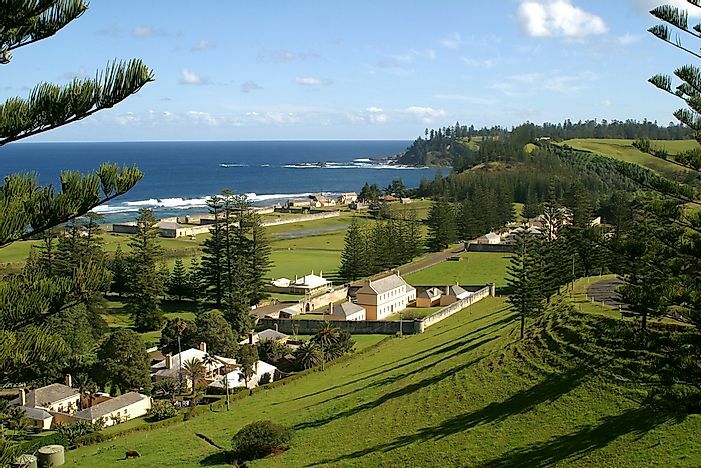 Norfolk Island, one of the External States of Australia. Australia is the 6th largest country in the world by total area. It comprises of the mainland of the Australian Continent and several islands including Tasmania. Australia can be referred to as the world’s smallest continent or the world’s largest island. Australia is subdivided into six states and two territories including Australian Capital Territory, Northern Territory, New South Wales, Queensland, South Australia, Tasmania, and Victoria. It also administers other states that are not part of the states and territories of the Australian Continent. All the states and the two largest internal territories are self-governed partially and are also represented in the federal parliament. Ashmore and Cartier Island consist of four low-lying islands located on two separate reefs, the Ashmore Reef and Cartier Reef. The territory is in the Indian Ocean located on the edge of the continental shelf about 199 miles off the northwest coast of Australia. Ashmore and Cartier Islands were placed under the Australian authority by a British Order-in-Council dated July 23, 1931. The territory in uninhabited and is administered from Canberra by the Department of Infrastructure and Regional Development. Australian Antarctic Territory is part of the Antarctica and is the largest Antarctica territory claimed by a nation. The territory placed under Australia in 1933 and is currently inhabited by about 1,000 people working in research stations. AAT is made up of all the islands and territories south of 600 except Adelie Land. The area is administered by the Australian Antarctic Division. Christmas Island is situated in the Indian Ocean, about 220 miles south of Java and 960 miles northwest of the closest point on the Australian mainland. The island has a population of approximately 2,000 people with the majority living in settlements on the northern tip f the island. Christmas Island is non-self governing and is currently administered by the Australia’s Department of Infrastructure and Regional Development. The island is popular for its biodiversity. Cocos Island, also known as Keeling Island, is also located in the Indian Ocean, midway between Sri Lanka and Australia. it consists of two atolls and 27 coral islands of which only two coral islands are inhabited; West and Home Islands. The two islands have a combined population of approximately 600 people. The West Island acts as the territory’s capital while its governance is based on Cocos Island Act of 1955. Norfolk Island is located in the Pacific Ocean between Australia, New Papua Guinea, and New Caledonia and about 877 miles east of mainland Australia’s Evans Head. The island has a population of about 2,300 people with the majority of the people living in its capital Kingston. Australia maintains authority on the island through an Administrator. The other two external states of Australia are Coral Sea Island and Heard Island and McDonald Islands. The sizes of the seven territories vary with the largest being the Australian Antarctic Territory which covers an area of about 5.9 million square kilometers while the smallest being the Ashmore and Cartier Islands which covers only 2 square kilometers. Christmas Island is the most northerly territory while Head and McDonald Islands are the most isolated territories.